Robert Kennedy & His Times- Arthur M. Schlesinger, Jr.
On November 19, 2008, the Tri-Borough Bridge which links the boroughs of Queens, Manhattan and the Bronx in New York City, was renamed in the honor of the late Robert Francis Kennedy. At the time of his assassination, the presidential candidate was an active senator from the State of New York. June 6, 2016 will mark 48 years since his murder but his legacy and name continue to live on. Arthur M. Schlesinger, Jr. (1917-2007) had served as special assistant to President John F. Kennedy from 1961 to 1963 and was a long-time Kennedy family friend. In this extensive biography, he chronicles the life of the seventh child of Joseph and Rose Kennedy and former Attorney General. 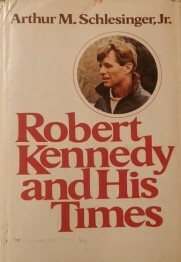 Dozens of books have been written about the Kennedy dynasty and “Camelot”, but Schlesinger’s account of Robert Kennedy’s life still stands as one of the best. At times he was simply called “Bobby” and at others, a range of names applied to him by friends and enemies alike. Often described as cold, abrasive and having a hair-trigger temper, Kennedy’s sharp piercing eyes and steel cold manner earned him the reputation as one of Washington’s toughest characters. However, Schlesinger also reveals a man with a heart of good intention deeply committed to his Catholic faith and the husband and father of 11 children. His strong belief in family ties would help guide him as he served his older brother Jack during their time in the oval office. His protective nature and ability to get things done by any means necessary has resulted in him being described as both the night watchman and the avenging angel of the Kennedy family. The events in Dallas shocked the world and left an entire nation in mourning. For Bobby, life would never be the same. But in 1968, he made the fateful decision to win the office his brother once occupied. His campaign and his transformation from persecutor of the mafia and Justice Department hawk into a champion of the people is one of the true shining moments of this book and his life. As a New York senator, his ability to reach the people of the ghettos and lower-income neighborhoods remains unmatched by any political candidate to this day. The once naive Attorney General had become a wiser and more engaged participant in the struggle for civil rights and the resolution of the raging Vietnam War. His win the California primary was a crucial victory in a campaign that showed enormous promise of success. Those who had felt betrayed after Dallas, found renewed hope that the direction of the country would once again change onto a path of positive reformation. June 5th changed that and the history of this nation. The 1960s saw the deaths of highly important figures and in the process spread fear throughout the nation. Sometimes I ask myself what if Kennedy had lived? He accurately predicted in 1961 that one day we would have a president of African-American heritage and was a strong supporter of Cesar Chavez and other minority groups in their quests for equality. I believe that if he had lived and were around to see the United States today he would be both satisfied and optimistic. His short life was filled with unforgettable events and he remains one of the most important people of the 20th century. For the full story of Kennedy’s life, Schlesinger’s book has no equal. Posted on July 17, 2015, in Biographies and tagged RFK. Bookmark the permalink. 2 Comments.